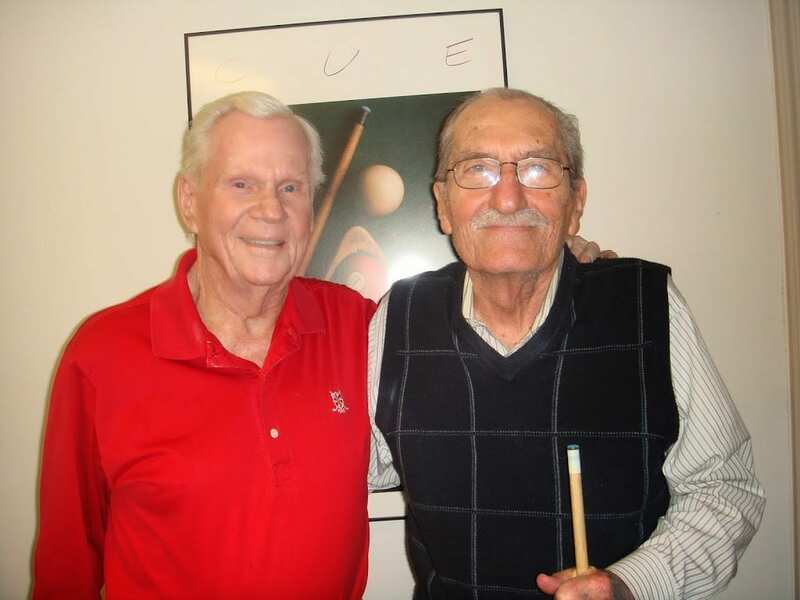 The Art Gallery is a must-see destination at Pickersgill Retirement Community. Located in a nook at the junction of two busy corridors outside the Willard Auditorium, Pickersgill’s Art Gallery is a space where examples of fine art created by resident artists are on display for everyone to enjoy for their imaginative, aesthetic and intellectual content. The revolving exhibits, which feature art on loan from the artists’ private collections, are curated collaboratively by the Gallery Committee (board members: Jean Smith, Jean Heill, Carol Mackay and community volunteer Jean Lillquist) in consultation with the artists. There are many talented artists among Pickersgill’s residents which means that the pieces selected for display in the Art Gallery change several times a year. Each new exhibit creates a high level of interest among our resident community as well as our visitors. Be sure to stop by the gallery next time you visit. Read on to learn about some of our featured artists. Research continues to show benefits for seniors who write. These include memory enhancement; improvement of comprehension and communication skills; stress reduction; and increased self-confidence, self-discipline, and even emotional intelligence. And sharing with fellow writers is an added bonus. 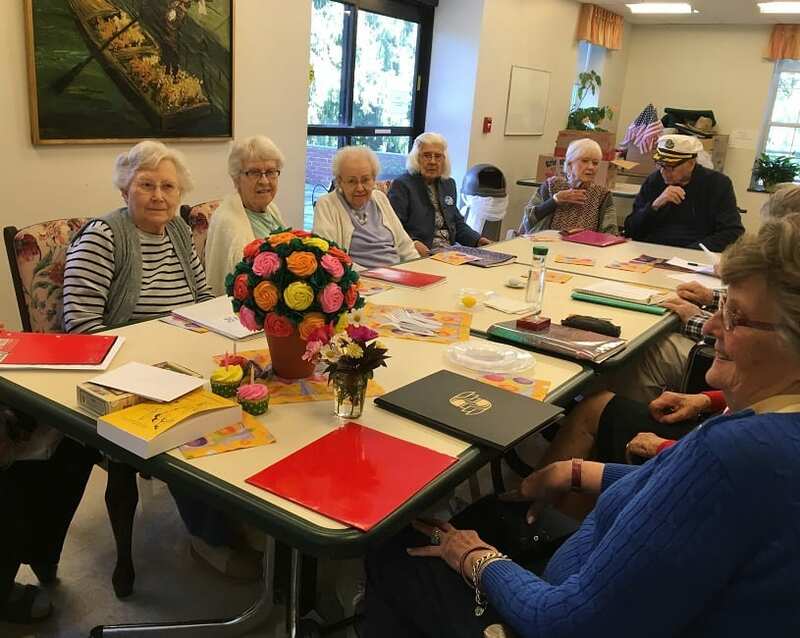 Enter Pickersgill’s Writing Group, a dozen or so residents who have been coming together every Friday afternoon for the past three years to share stories they’ve written about their lives. Initially a gathering of people who like to write but may need a little nudge, the group has become so much more. It’s a warm, supportive family composed of very different people who have lived through many similar experiences. Each week group members share what they wrote during the week. There is always a suggested assignment, and the topics span the spectrum, from holidays to happiness to milestones to favorite books and music. Some topics are tougher than others; writing about parents proved difficult for some. Not everyone writes every week, and not everyone writes on the assigned topic. Everyone does share though, and discussions are lively and funny and poignant. The group has celebrated birthdays (two members are 98) and mourned the departure of others. But every Friday when they gather aches and pains are temporarily forgotten while sharing stories and laughter. In 1954, “I Love Lucy” was the top-ranking TV show, Marilyn Monroe married Joe DiMaggio, Eisenhower was president, and the Orioles debuted in Baltimore. 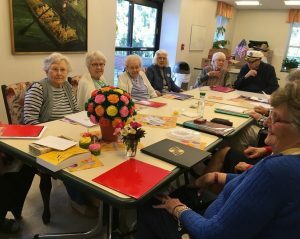 For Olga Wagner, 96, a resident at Pickersgill Retirement Community in Towson, Maryland, it was a start of a lifelong love affair with America’s Pastime. Though Olga grew up in New Jersey, she moved to Baltimore when she was 20, and Maryland has become her home. The Orioles have been her favorite team since the team came to Baltimore in 1954; she cheers them on through every game. Her love of the Orioles began with her children. Her daughters were both members of the Junior Orioles Dugout Club and loved watching baseball. The family lived only five minutes away from Memorial Stadium (the Orioles home field until 1991) and regularly watched games there. Having been a fan since the beginning, she has seen heart-wrenching defeats and lived the pure joy that floods through a city when the home town team wins the World Series—something every Orioles fan under the age of 34 has yet to experience. Understandably so, Olga’s favorite Orioles memory is when the O’s defeated Pete Rose and the Philadelphia Phillies to claim the World Series Championship in 1983. Like many Baltimore Orioles fans, Wagner’s favorite Orioles player is Cal Ripken Jr., and her favorite moment in a game happened on September 6, 1995, when Cal Ripken Jr. started in his 2,131st consecutive game, breaking Lou Gehrig’s “unbreakable” 2,130 consecutive game record. Though Wagner has not attended an Orioles game in several years, she still watches every game she can on television—often staying up late to do so. 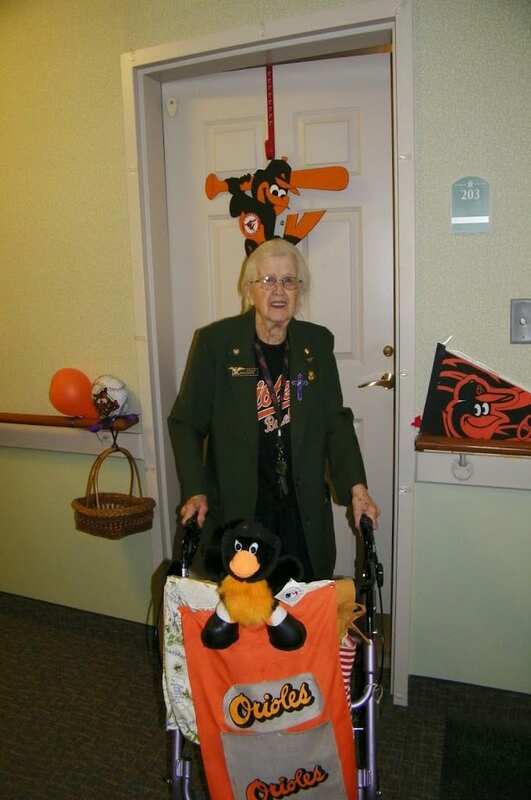 Olga collects Orioles pennants and often wears her Orioles shirts to show her team support. 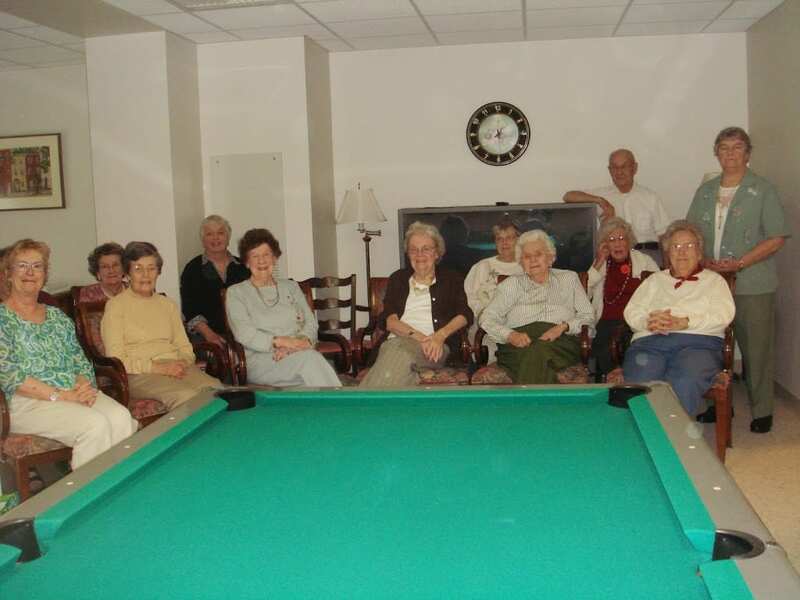 For the past 25 years, Jerry Mead has enjoyed making friends and making a home at Pickersgill Retirement Community. “There’s no place I’d rather be,”Jerry says. When Pickersgill’s first cornerstones were being placed, Jerry and his wife watched from their home no more than a block away. “I watched them build it,” he remembers. That marked the exciting beginning of Jerry’s long and happy relationship with his future home. Pickersgill’s welcoming community has balanced independence with assistance in a way that allows residents like Jerry to live full and happy lives, no matter how long they decide to stay.